We mentioned the original IR LED multitouch array a while back, but I ran across this DIY version built by [Thomas Pototschnig]. It features an ARM7 controller with USB 2.0 with a 25hz+ capture rate. He’s promised to put up code and schematics when he builds the next version. Pretty likely. I set up a turn signal for my electric motorcycle that used a basic stamp running 7×2 strings of leds (to get the knight rider strobe effect for signalling). I used ethernet cable to run the leads and it all worked perfectly on mockup, but when i soldered the board together i somehow ended up with the leds reacting to proximity, sending a signal to the stamp and throwing the program off. It was kind of aggrivating to get an anomaly like that but i did wonder if someone used it to build stuff like this. very cool. Perhaps… though, the way I understand it works is that the LED projects light, which bounces off your finger, which is captured and measured on the return by the photodiode property of LEDs, not by any particularly ambient light or the IR your finger gives off (though I could be wrong on that part). If that’s the case, then it could only really be used to turn lights off, not on. It could make an interesting “Lights Out”-style game, though… and could absolutely be useful in certain cases. Stuff like this is why I really wish I were taking an electronics education, instead of computers. Oh well, I figure I can pick some of it up meself. I guess these things do act like input devices seeing as how we have a heat signature. With a normal LED I have concentrated light onto one and detected voltage, they get pretty excited when you hit them with the same color as they are. There wasn’t really a whole lot of info in the article, what is that xdrawingarea widget showing? some kind of heat map? I had assumed (like with the LEDs creating current in response to a light incident) LEDs would only be able to detect in the frequency they emitted and that the frequency was fixed:red, green, yellow, blue, purple, IR, … you would think that a red LED would only respond to i.e.680nm – that 400nm UV would be invisible to a red, yellow, green detector. This IR doide, then(and widget) is mapping the current level I suppose(you’re only really seeing a single IR ‘color’)…Oh. OK. I get it? I wonder how scalable this is. Both examples seem to be smallish in nature. Would this work on an interface the size of say a 20 inch monitor? Would surface mount LEDs work as well for this principle? I recommend to also take a look at his other projects, especially the MiniGA graphics adapter. It’s a really neat device. i would assume its scalable if it’s the LED’s picking up the IR light being reflected off your fingers.. he also said it works independently of most ambient light so, lights on or off wouldn’t matter. you could scale up if you could manage to maintain precision… that looks really cool either way, props man. Surely you could just alternate rapidly between input sensing and doing light output to emulate bi-directional input/output from the panel? Imagine an LED table that was as dense with LEDs as this panel is, and had multi-colour LEDs that reacted to objects atop the table? This looks like it could be modified to be on/off indicator and switch. Would take multicolor leds and use them as a toggle indicator, one color for on and the other for off, delay state change(debounce) in software. I (tried to) implement jhan’s matrix for a class and found that i had horrible issues with crosstalk from other LEDs in the same column (which is OK if you have low ambient light in the receptive band for your photoelectronic element like in his video, but it wasn’t true for the red or green leds i was trying). haha….he was unhappy that nyu only posted a demo video and no details. so he makes his own version from scratch…and only posts a demo video and no details. that’s hilarity right there. anything) which would mean that there’d never be any reflected light during its sampling time, which leads me to believe they’d have to detect using ambient only. 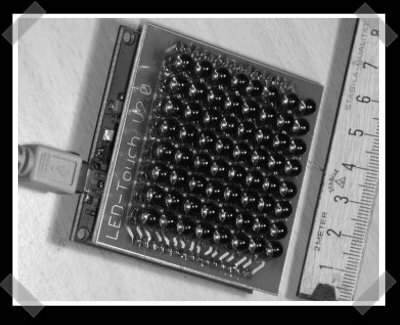 With a report rate of around 40ms for an 8×8 array that covers 6″. It would require multiple chips to do parallel capture for scaling it up to a 20″ monitor and getting a reasonable touch and feel. This reminds me of the Tenori-on. hmm…makes me wonder is you could use a modded OLED screen in the same manner. this would give you an actual touch screen instead of touch panel. I released all information (Source, Schematic, Board) under the GPL V2.